Give it a go! FREE Cardio Ballroom demo this Thursday at Wylie Recreation Center. No Recreation Pass required. Open to ages 18 and up. Register for either of the two upcoming demos at Wylie Recreation Center front desk 15 - 20 minutes prior to start time. Space is limited. 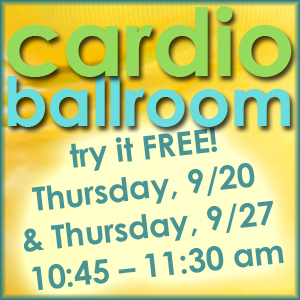 Cardio Ballroom Demo Dates/Times: Thursday 9/20, 10:45 – 11:30 am and Thursday 9/27, 10:45 – 11:30 am.